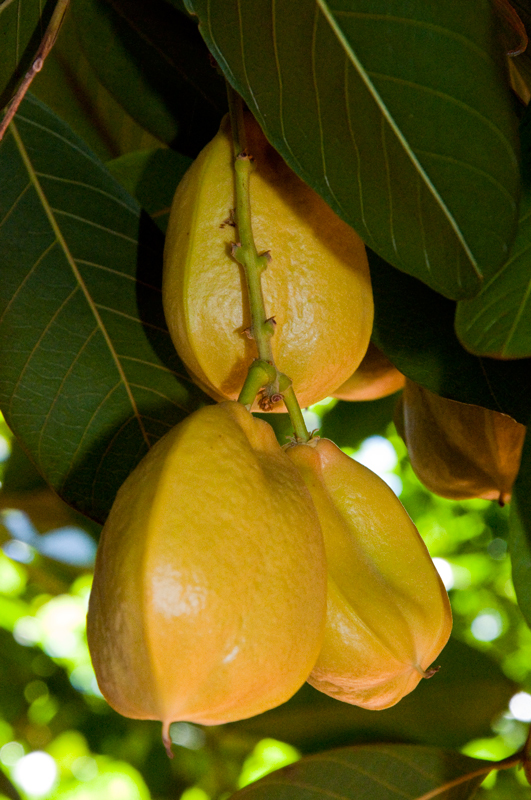 Ackee (Ah Kee) will kill you if you eat it before it's ripe! I have great news! A column I have been trying to sell finally sold. Kauai is a hotbed for people who eat healthy and care about things grown locally, organically and sustainably. It’s one thing that crosses all races; everybody is keenly interested in these things. It think it’s because we are isolated, and if the barge that provides 90 percent of our products doesn’t show up, we’re kinda screwed. We have a vested interest in being sustainable; in taking care of the small amount of land that we have to grow food on. These are things I have been interested in for at least ten years. I care about how food gets to my table. In Colorado, I would go out of my way to buy meat from a local butcher who had a small ranch 30 minutes away. 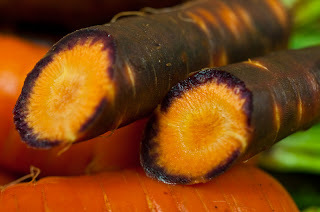 I joined a community supported agriculture (CSA) program because I wanted to know who my farmer was, I wanted to support his organic farm, I wanted produce that was fresh and in season and not stale from having travelled over 3000 miles. No tomatoes in December! 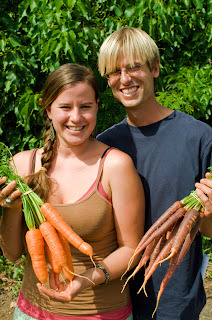 Levi and his girlfriend Kristen sell beautiful produce to Dan including Purple Haze and regular carrots. 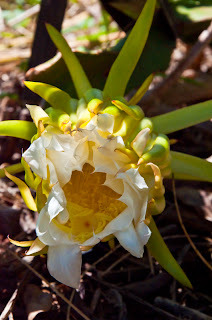 Once I got to Kauai, I learned that things don’t grow year-round here. Duh! I also found it difficult to find who the local farmers were, they don’t advertise. The farmers markets here last about two hours and in that short time, you have to act quick. Don’t waste precious seconds debating over a pineapple or you’ll lose it to someone else! The farmers here are the same as in Colorado, some of them don’t always sell produce from their farm. Some farmers bought Maui Gold pineapples from Costco, took off the tags, and sold them as their own. The only trace of fraudulence is a tiny hole in the leaf where the tag once was. 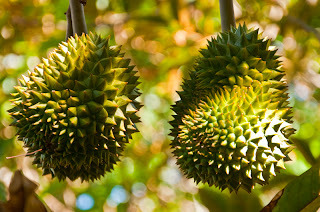 Durian tastes like blue cheese when it's ripe. It doesn't taste bad but when you're used to fruit being sweet, it's kind of weird. I was really frustrated. Besides the farmers market, the only way I could get good produce was at the health food store and that was expensive. 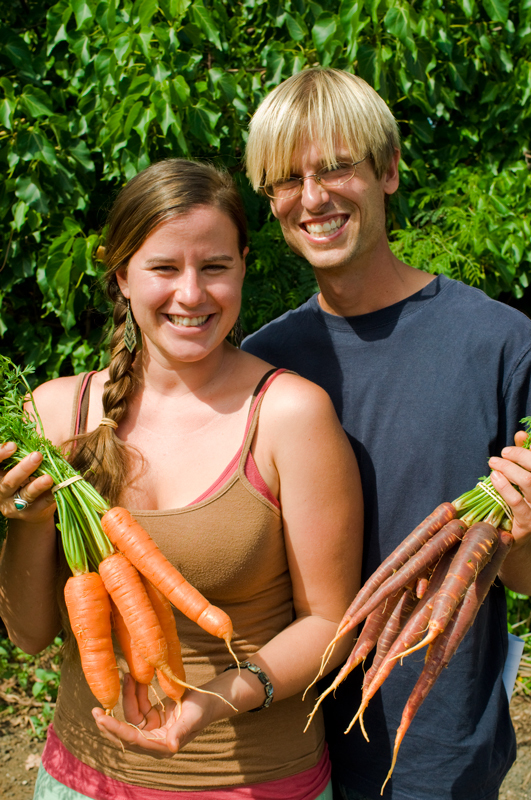 I did a search and found the only organic farm on Kauai that had a CSA. When I signed up I also signed up for their 12 week “Seed to Table” course at Kauapea Farms where I learned what it takes to fill those boxes every week. 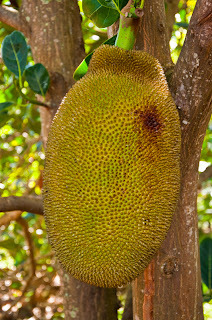 Jackfruit can weigh up to 25 pounds! It's supposed to taste like a cross between a banana and pineapple but I haven't tried it. Yet! My weekly column is the fruition of this search and I hope to provide readers with information and generate business for farmers, grocery stores and restaurants. 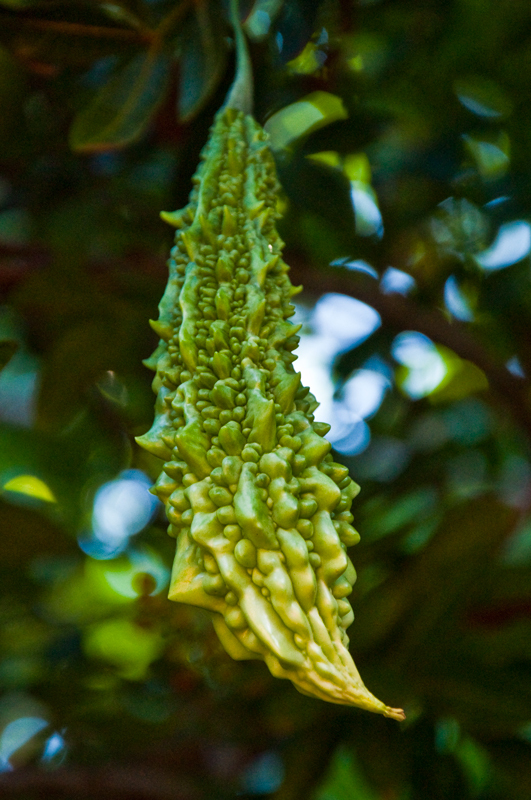 It is called Farmers and Their Markets and will debut in MidWeek Kauai the week of May 31. The column will feature a different farm, what they grow, where you can get it (including farmers markets, grocery stores and restaurants), how to select and store and health benefits. It will spotlight a particular seasonal item and include a recipe. The first is avocados which grow like crazy here. 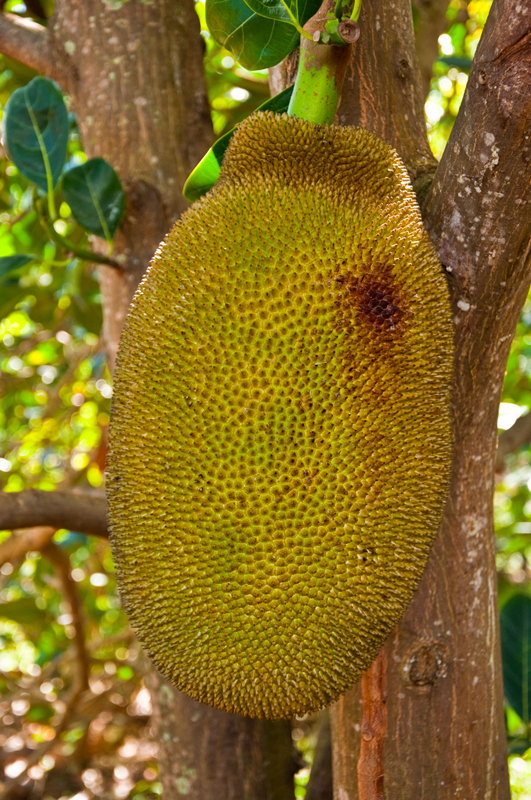 Did you know that they have anti-inflammatory benefits that help prevent cancer, heart disease and arthritis? They also lower bad cholesterol levels. As the produce manager for Papaya’s, Dan works with local farmers everyday, and he is my source. I couldn’t do this column without him and his contacts. Mabolo originated in Africa and has the texture of a peach but the flavor is more savory according to Dan. I sent two samples to the MidWeek editor in February and waited a month before he said, “Maybe next quarter.” I tried to sell it to another local publication and they said they would love to have it but couldn’t afford to pay me. I finally sold it to our main newspaper but had to withdraw because they are competition for the main publication I write for. I sent it one more time to MidWeek, as a reminder that a new quarter had begun, and they called me Thursday saying to have one ready for Monday! 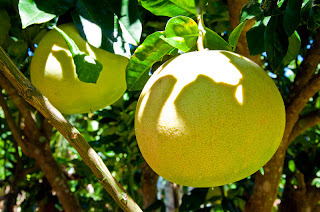 Pomelos weigh about 3 pounds and are like a sweet, mild grapefruit. 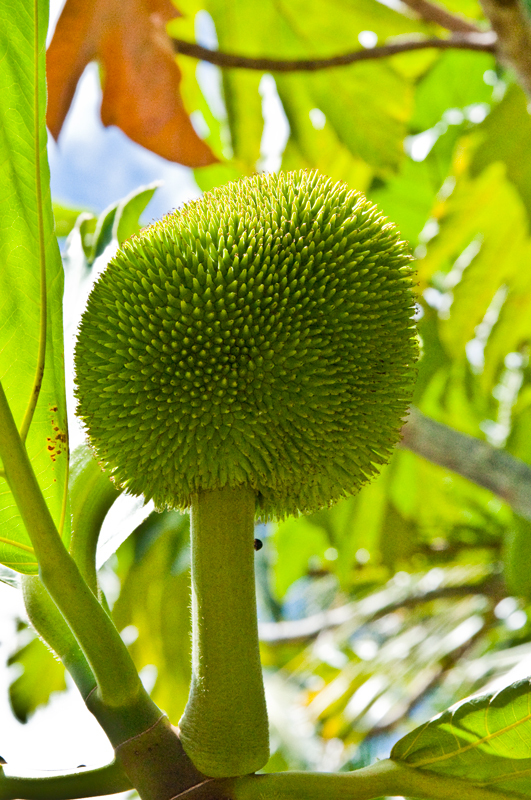 Ulu (oo loo) or breadfruit. This is a young one, they end up weighing about 2 pounds and can feed a family of four. Typically, they are roasted or baked and are similar to potatoes except sweet and a little slimy. 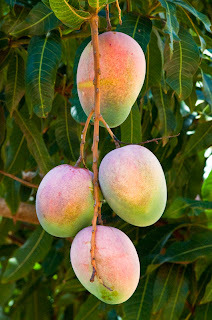 There are over 300 varieties of Mangos in the world, on Kauai there are about 75. This is a dragon fruit flower, it's about the size of a football. 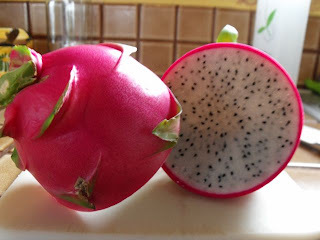 These are one of my favorite fruit. 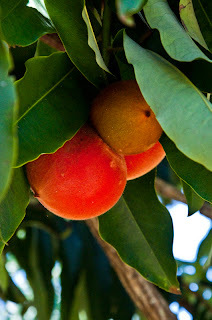 They are sweet, mild and really juicy. The little seeds pop when you eat them. This is a dragon fruit when it's ripe. You cut it in half (one half fits in the palm of my hand) and eat the white part with a spoon. The pink part acts like a bowl! Yummy and fun! Wonderful website. A lot of useful info here. I am sending it to some buddies ans also sharing in delicious.